What comes to mind when you hear the word “passport”? Most answers probably include things like travel, excitement or adventure. Well this is exactly why Honda’s newest mid-size crossover lives up to its name. The highly anticipated 2019 Honda Passport has garnered interest for a number of reasons. For starters, it fills a void in Honda’s lineup. Bigger than the CR-V, but smaller than the flagship Pilot, the Passport isn’t a compromise – it’s the best of both worlds. The Passport is also off-road friendly. Meaning it’s capable of taking you just about anywhere. With models officially starting to roll into showrooms now, here’s a map of what’s what on the 2019 Honda Passport. The Honda Passport comes in three available versions. The base model is the Sport, then there’s the EX-L and the top trim is the Touring. All three trim levels come with the 3.5-litre i-VTEC V6 engine. All in all, this engine delivers an impressive 280 horsepower and 262 lb-ft of torque. Also standard is Honda’s i-VTM4 AWD system. By sending power to all four wheels, drivers get better traction no matter the conditions. In addition to AWD, the Passport also comes with the Intelligent Traction Management System. This allows drivers to change between Snow, Mud and Sand modes. The 2019 Honda Passport provides an incredibly smooth ride. This is largely thanks to its 9-speed automatic transmission and 4-wheel independent suspension. If you had any doubts that this SUV could handle adventure, just take a look at its towing specs. The Honda Passport touts an impressive available 2,268 kg of towing capacity. Though the Passport is a five-seater like the CR-V, it has an extra ten inches of length. In terms of cargo capacity, this adds an extra 33 percent! With the seats up, the Honda Passport offers 41.2 cubic feet of cargo space. This is enough to hold plenty of gear on its own. However, you can get even more room from the sliding and reclining 60/40 split-folding second-row seat. With the second-row seats down, the cargo space expands to a whopping 77.9 cubic feet. Add in the underfloor storage compartments, and the Passport easily has more than enough room for your next adventure. There’s no question the Honda Passport can take you anywhere. But did you know it can also offer peace of mind no matter where you are? 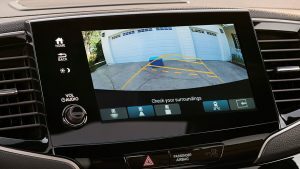 With available features such as HondaLink and Honda Satellite-Linked Navigation System, you can stay connected wherever your adventure takes you. It’s safe to say the 2019 Honda Passport packs a lot of excitement into one mid-size SUV. With serious off-road capability and Honda’s trusted reliability, the Passport could be your ticket to anywhere. To get your first look at the all new Honda Passport stop by the showroom. Or to feel the excitement for yourself, give us a call and set up your test drive today.